Another morning with minor storms, not enough to wake us but mostly because our sleep schedule is so off right now that we had already been awake for some time. It was probably about five o'clock when we started the day though in a somewhat slow and gradual kind of way. We breakfasted together again by coincidence, all four of us happened to be up and hungry at the same time. Once we had eaten and collected ourselves we met up with Yi and Pannha, friends of my friend Andrew. They lead groups of international high school students on public service type activities throughout the country. Right now they don't have students to lead right now so they offered to show us around a bit. Who wouldn't want a local to play the part of your guide? Yi and Pannha decided that it was important for us to see the killing fields at the Choeung Ek Genocidal Center so to keep us in a single slightly crowded tuk tuk Pannha excused himself and we bounced our way outside of Phnom Penh. There are so many motorbikes and tuk tuks that traffic never really moves very fast and it seems like there is a patchwork of paved and semi-paved streets that jostle you as the driver tries to keep up with traffic while avoiding the worst of the potholes. On the way Yi explained that the atrocities of the Khmer Rouge were not taught when he was in school so many people of his generation only know what they've been able to piece together or find out on their own. Official estimates of the number of people killed during the reign of the Khmer Rouge range from 1.4 to 3 million with a total previous population of perhaps 7 million. That is roughly between a quarter and half of the population! The rest were herded out of the cities with the leadership claiming imminent bombing by the United State to motivate people to flee their homes to the safety of a more agrarian lifestyle. The victims of the Khmer Rouge were ethnic and religious minorities, leaders outside of Khmer Rouge influence, intellectuals, artists, professionals, and those who were unwilling or unable to adapt to an agricultural lifestyle. Walking through the killing fields was an odd experience. There is a stupa that dominates the site, it is quite beautiful, but as you approach you can see that the middle is composed of a series of encased glass shelves and on each is piled the sorted skulls of hundreds upon hundreds murdered people sorted by gender and background. Then you look out over the lawns and start to see depressions where mass graves were exhumed, the ground looks like a series of deep rippling waves. Some trees were marked out for special attention and the signage explained that upon their trunks the heads of babies were smashed. The Khmer Rouge wanted no survivors in the family of their victims. Those trees still stand and terrible to think that they were covered in blood, living tools of murder. The museum on site also showed the tools of execution. All the implements of death employed were those that are silent, no guns but knives, axes, clubs, and gardening tools. Initially it seems to personal and messy, that it would make genocide much more difficult for the perpetrators but then you read that there were people, not victims, living and working nearby and the Khmer Rouge didn't want them to know what was happening at the camp. It's just difficult to look around and know that the land you're standing on in soaked in blood and to make matters worse about half of the leadership, the modern monsters, are still alive awaiting trial for their crimes. It was terrible and sobering but I think that it is an important part of the history of Cambodia, that it informs a lot of their current society. We were told by Tim, Francene's husband, that approximately ninety percent of the population is composed of subsistence farmers; perhaps a holdover of the Khmer Rouge agricultural ideal. No person is unaffected by the actions of the Khmer Rouge but what is remarkable is how the people have recovered. They are so open and friendly, they smile and laugh and seem pleased to have visitors to their country. On our way back into Phnom Penh we stopped off at a small rural open air market. Kids were just being let out of school and they eagerly greeted us by saying "hello" as they rode by on their bikes of walked past us. I suspect that they aren't accustomed to seeing foreigners stop in their neighborhood. It was a lot of fun really because instead of being accustomed to and jaded by all the foreign visitors that you sometimes see in the city the people here were genuinely excited to see us. Children posed, women waved, and smiles were exchanged. It was such a stark contrast to our visit to the killing fields just five minutes away. 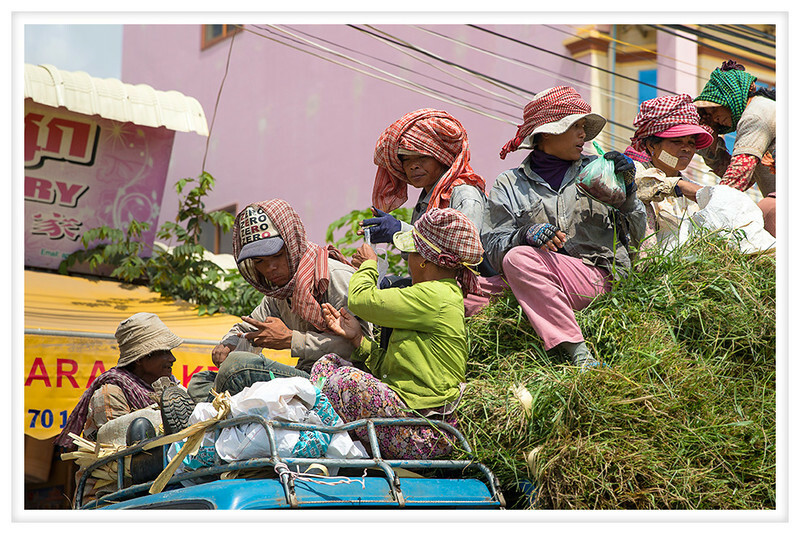 We made our way back towards Phnom Penh and saw tuk tuks and trucks loaded with people and workers respectively. Below is an illustration of a typical work truck with people piled on top of the fruits of their labors. I know the roads are a bit rough and the grasses absorb some of the impact but it also causes them to bounce higher into the air. Still, I expect that accidents are rare and that the workers are accustomed to riding safely. We then had lunch and chatted more about life in Cambodia with Yi. He was a fount of information and as we ate we talked and I feel like I have a much better grasp on how people live, what they think, how the country is changing, what they worry about for the future. It was invaluable and I am grateful that Yi was so willing to field our persistent questions. After lunch the heat of the day was beginning to take its toll so we headed back to the hotel. Araceli and I chatted and planed for the our additional time in Phnom Penh and took the chance to run out and buy some more fruit. We came back with rambutan, longan, and fresh young coconuts so we picked and emailed with Francene so we could get together for dinner. To change things up a little from all the Khmer food we opted for a little Indian which was a nice change of pace.